This week has flown by in a flurry of running round doing jobs and preparation for the return to school so not as much progress was made on projects as I would have liked. The most worked on project this week was the Rainbow Squares Blanket, the first in the trio of rainbow blankets I need for gifting. All the squares are complete and later today I can start to edge and join them as I go. In the evenings I’ve worked a bit on my Drops of Firelight shawl, this is strictly an evening project, counting yo’s and adding beads, teeny tiny beads with a 1mm hook is not a project you do when you have active young children about. I have a couple of rows to complete this evening on the third section and then I have one remaining small last section with bind off. It theory is should be complete ready to be blocked by next weekend but well you know theory and practice and all that! I did cast on the swatch for my new Celtic Knits design, note to self I must invest in a ball winder, I did roll these centre pull yarn cakes by hand much to everyones interest during the week but it would be so much quicker with a ball winder, bish bash bosh job done kind of thing! That’s it for actual projects worked on. Behind the scenes I gathered the yarn to start the Eole cardigan for Evelyn (I’m really hoping to get that started soon), I ordered the yarn needed for the Miss Marple for Elizabeth (I now have the yarn for all the projects for the younger children on my list so can now just proceed with them), I wrote up the Sam Burrow pattern ready to get tested, I’ve a couple of other items I’ve done for A Land Close By this week that I can’t mention just yet and I have been playing around with other design ideas for Celtic Knits. I also got Caoimhe’s Sunday Sweater blocked and once it’s dry and the weather clears a bit I hope to take some photos of it. I also need to snap some good photos of Flowing Uphill which is currently at the testers. This week project work is going to consist of the above projects with all going well a start on the Eole cardigan. My Ravelry projects page is up to date with all projects and where each is at at the present moment and you can check it out here. To check out our YOP group and to read other blogs taking part or indeed to join in just check out the group here. This entry was posted in Celtic Knits, Crochet, Knitting, Year of projects and tagged Blanket, Celtic Knits, Drops of Firelight Shawl, Rainbow Squares Blanket, Rainbow Trio Blankets, Shawl. Bookmark the permalink. Your rainbow squares are so pretty, I love the ‘join as you go’ method, so much easier than all that stitching. Your Drops Of Firelight Shawl is beautiful, I can imagine how much patience is needed to attach such tiny beads. 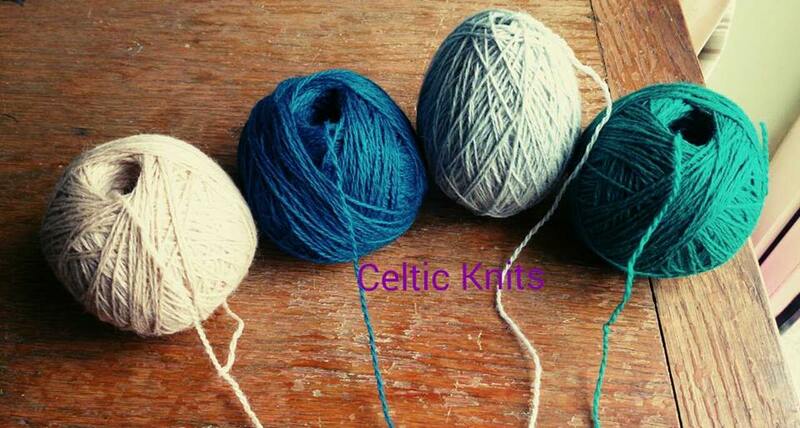 Can’t wait to see what your new Celtic knits design will be. Ruth, you always amaze me when you say not much done and then go on to say all that you have done… your not much done would be a good week for me…! I’ve begun to suspect my version of not a lot done doesn’t match too many others, what can I say I seem to aim big, must be something to do with my small height haha. You have been busy and with school starting too? Do we knit/crochet faster under pressure? I love the rainbow blanket and that shawl is drop-dead gorgeous! I too can’t wait to see your Celtic Knits and I would love to get my hands on some of those Celtic knit markers…so pretty. I have lots of catching up to do with missing last week. Always love all your projects. 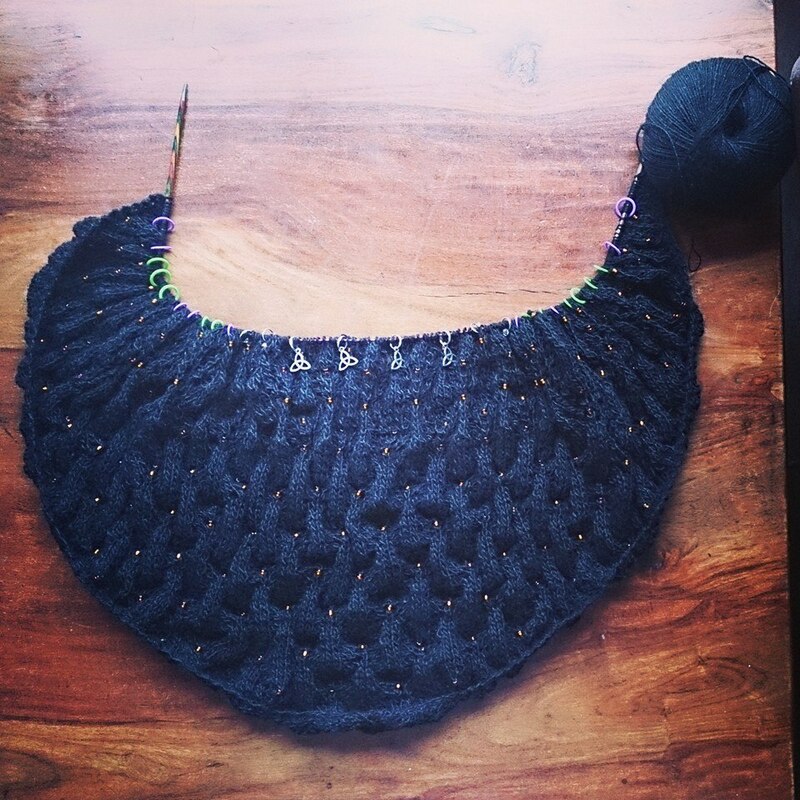 Your shawl is simply stunning and I fully expect to see it finished next week! I can’t wait to see the rainbow blanket in its full glory. Love the rainbow squares and the celtic knits colors! Your shawl is so beautiful, you’re so talented!! That shawl is crazy beautiful! I will try a beading project one of these days. Love seeing those squares stacked up like that. They are in a great array of colors. I like how you wound up the cakes by hand. They look rustic but so cool. Mine don’t look like that when I do it for leftover yarn. Cool! Thanks for the support. I am so love with your shawl. I can hardly wait until it is finished and modeled. I’m looking forward to seeing your blanket assembled. Do you know which border you will use? I’ve ideas at the moment for it but the final decision will be made when it’s complete and I see it all I think. I will looking out for it – I’m planning on doing the same with my blanket. 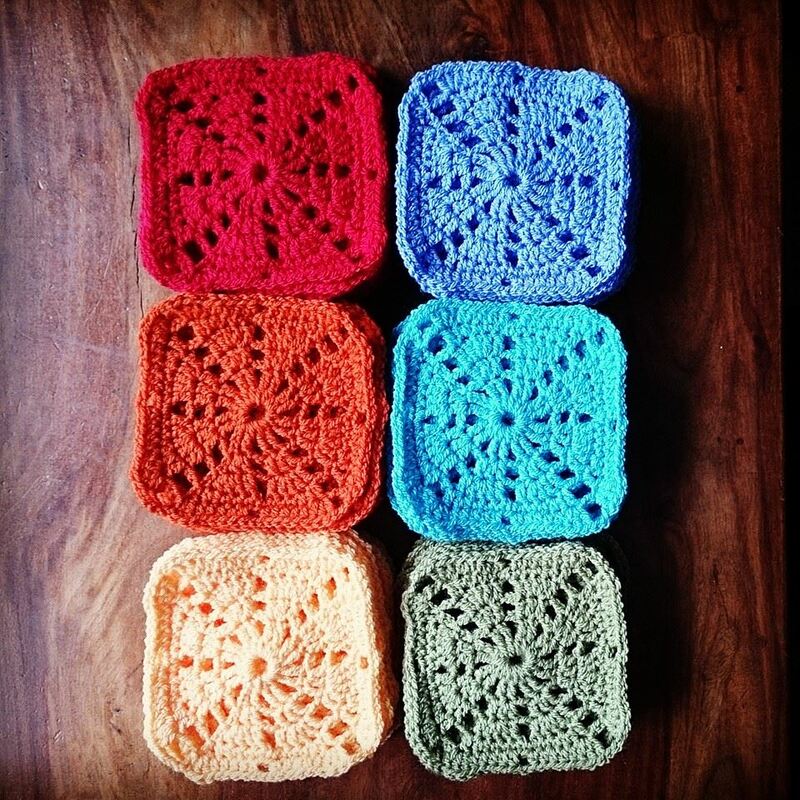 The rainbow squares look lovely and so does the Drops of Firelight shawl. Can’t wait to see it finished and blocked.